A new image of the Omega Nebula, captured by ESO’s Very Large Telescope (VLT), is one of the sharpest of this object ever taken from the ground. It shows the dusty, rose-coloured central parts of this famous stellar nursery and reveals extraordinary detail in the cosmic landscape of gas clouds, dust and newborn stars. The colourful gas and dark dust in the Omega Nebula serve as the raw materials for creating the next generation of stars. In this particular section of the nebula, the newest stars on the scene — dazzlingly bright and shining blue-white — light up the whole ensemble. 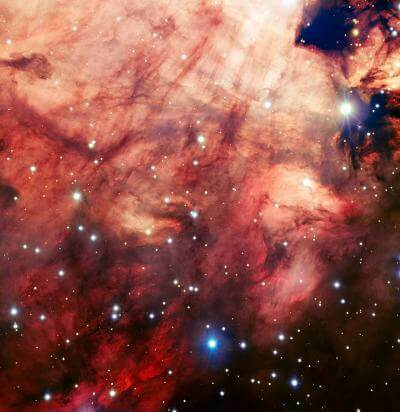 The nebula’s smoky-looking ribbons of dust stand in silhouette against the glowing gas. The dominant reddish colours of this portion of the cloud-like expanse, arise from hydrogen gas, glowing under the influence of the intense ultraviolet rays from the hot young stars. The Omega Nebula goes by many names, depending on who observed it when and what they thought they saw. These other titles include the Swan Nebula, the Horseshoe Nebula and even the Lobster Nebula. The object has also been catalogued as Messier 17 (M17) and NGC 6618. The nebula is located about 6500 light-years away in the constellation of Sagittarius (The Archer). A popular target of astronomers, this illuminated gas and dust field ranks as one of the youngest and most active stellar nurseries for massive stars in the Milky Way. The image was taken with the FORS (FOcal Reducer and Spectrograph) instrument on Antu, one of the four Unit Telescopes of the VLT. In addition to the huge telescope, exceptionally steady air during the observations, despite some clouds, also helped make the crispness of this image possible . As a result this new picture is among the sharpest of this part of the Omega Nebula ever taken from the ground. This image is one of the first to have been produced as part of the ESO Cosmic Gems programme . The “seeing” — a term astronomers use to measure the distorting effects of Earth’s atmosphere — on the night of the observations was very good. A common measure for seeing is the apparent diameter of a star when seen through a telescope. In this case, the measure of seeing was an extremely favourable 0.45 arcseconds meaning little blurring and twinkling of the object of interest. The ESO Cosmic Gems programme is an outreach initiative to produce images of interesting, intriguing or visually attractive objects using ESO telescopes, for the purposes of education and public outreach. The programme makes use of small amounts of observing time, combined with otherwise unused time on the telescopes’ schedules so as to minimise the impact on science observations. All data collected may also be suitable for scientific purposes, and are made available to astronomers through ESO’s science archive.